Redfin says it’s fashioned a tool for sellers that boosts the odds that a home will receive multiple offers, marking the brokerage’s latest technology rollout aimed at burnishing its appeal to sellers. Redfin’s agents can use “Last Call for Offers” to fire out an email to people who have demonstrated some interest in a listing through an interaction with Redfin, such as by viewing or favoriting the listing on redfin.com or a Redfin mobile app, or touring the listing. Agents can use the tool after a listing receives an offer or just before a seller plans to take a home off the market. The brokerage says its internal data suggests the feature is working. Over the past three months, 60 percent of homes sold by a Redfin agent received multiple offers when a Last Call was issued, compared to 49 percent when a Last Call was not issued, Redfin said. Screen shot of ‘Last Call’ email. Redfin published a blog post on Last Call in early February, but waited until today to publicize the feature in a press release. 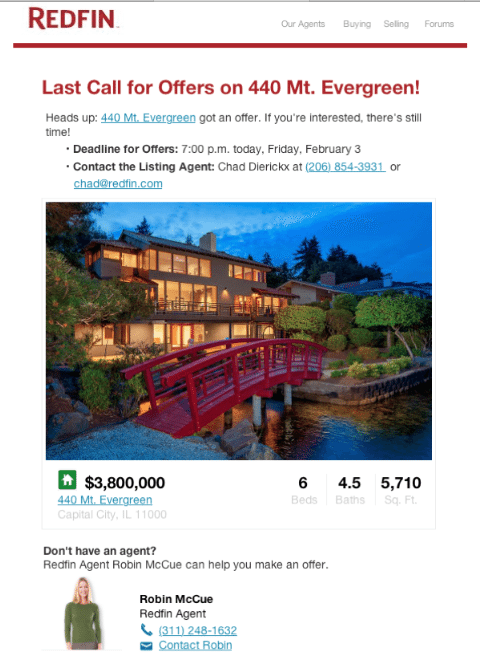 A Last Call email includes a photo and description of a home, the offer deadline and the Redfin listing agent’s name and contact information. Last Call marks Redfin’s latest attempt to woo sellers with new technology. In August, the brokerage announced it would produce 3-D models powered by Matterport for all its listings, and also introduced a dashboard that lets seller clients see how many people are viewing their listing online and what their agent is doing to sell it. The brokerage continues to offer the discount in those markets, while charging 1.5 percent everywhere else, Redfin said. The brokerage also recently unveiled a tool that lets buyers collaboratively search listings with agents and their advisors.